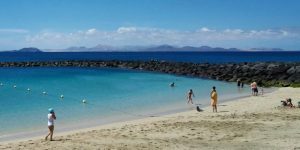 The Canary Islands are a popular destination for British travellers throughout the year. Offering attractive temperatures this collection of seven islands is an ideal escape from the seasonal gloom of the UK winter months. However, the weather isn’t the only attractive feature of this attractive archipelago. If you have the opportunity to holiday on these lovely islands and don’t take sign up for an ‘All Inclusive deal’ you will be pleasantly surprised by the lower cost of living. The Canaries have a huge trade deficit and their primary exports are bananas, sugarcane, tomatoes, potatoes and tobacco. So it is astounding that some food and beverage items are actually cheaper than mainland Spain. How do the essential holiday prices compare? In the UK an average main course in a restaurant would set you back 12 euros. In Spain, this would be 10€. On a recent trip to Lanzarote, I was fortunate enough to sample some great dishes for 8€ and some outstanding dishes for 15€. However, the biggest saving on my holiday came on wine, beer and coffee. With espressos under 1.50€ and cappuccinos averaging under 2€, a mid-morning stop in a beach cafe was an attractive indulgence. Even the local wine, which was very drinkable, was a decent 5-7€ a bottle on the supermarket shelves and 10-15€ in the restaurants. Cava was more affordable and just as tasty as Prosecco, averaging 3-5€. Bottled beer was cheaper than mainland Spain at under 2€ and draught beer was significantly cheaper than in the UK pubs. Happy hour deals reduced these prices even further with a double gin and tonic temptingly priced at 4€. On a more sensible note, fruit and vegetables in the supermarkets were about average for Europe. As were the basic cooking items such as sugar, salt and cooking oil. The only item we couldn’t find cheaper than the UK was suntan lotion, so make sure you stock up before you go! £1.00 = 1.14€ at the time of writing.